We have spent a lot of time in recent months studying the specifications for "Uu", the UMTS 3G subscriber interface. The spec is an obfuscated mess and the experts who publish books seem to disagree on a lot of critical details. In fact, the literature is so inconsistent that we are starting a public wiki-based documentation project. 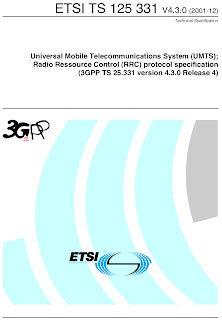 In its basic form (non-HSPA), UMTS can deliver 384 kb/s per channel with up to 4 such channels active at once, assuming good link margins, small delay spreads, good power control, proper phase of moon, low traffic levels in surrounding cells, and generally clean living and happy thoughts on the part of everyone involved. That's just over 1.5 Mb/s on a really, really good day. To do this, UMTS musters just about all of the fancy math that the 1990's had to offer: orthogonal spreading codes (at least, orthogonal until they hit the real world), turbo codes, rake receivers, multisensor diversity demodulators. In exchange for all of this complexity you get roughly half (yes, half) the usable bit rate that you could get from an EDGE-style PSK/TDMA interface in the same bandwidth, except that the PSK/TDMA approach would provide more solid QoS guarantees, use a lot fewer transistors and be more power-efficient due to smaller crest factors in the amplifiers. And what did UMTS do for the carriers? It nearly killed them. They overbid for the spectrum, barely had enough money left to roll out these really expensive new networks and when it was over they discovered that all their customers really wanted was better coverage and lower bills, neither of which have anything to do with UMTS. (The iPhone later proved that lack of demand for data was mostly due to the carriers' walled-garden approach to the itnernet, but that's fodder for a different post.) The killer app for the next five years turned out to be text messaging and economists got to write lots of papers saying things like "We conclude that the rationalization of bidding in the United Kingdom’s UMTS auction remains problematic." And just as the carriers are starting to recover from UMTS, the usual suspects start pushing the next shiny, new thing: LTE/IMS. Any thoughts on CDMA/EVDO thing? I think CDMA is a bad choice for cellular air interfaces, regardless of the implementation. Cdma2000 WCDMA is just as bad as UMTS WCDMA for all of the same reasons. A single company has a stranglehold on the IP. The codes are never really orthogonal on real channels, so performance is never anywhere close to theoretical. It requires tight power control to prevent near/far dynamic range problems. It requires the radio to run at wide bandwidths and high duty cycles regardless of how much bandwidth the applications using that radio really need. Since the main performance limiter is inter-user interference, QoS in the lower layers varies wildly with system load. CDMA is just a bad technology for this application. Sent you a mail the other day about opportunities in Africa, can you please respond. Some things stated in this article might be true, hovever most networks which run HSPA today provide very good QoS... and they are just a software upgrade of the UMTS (Rel99)networks. So definitely UMTS had limitations but it was far from being a dead-end as a technology. Yes, granted, by doubling again the complexity of the PHY, UMTS can provide the same QoS of a much simpler system. And I say that UMTS is grotesquely complex for what it does, not that it is a dead-end technology. It is likely to be with us for another 15 years, maybe longer since a move to 4G requires a completely new core network. David, HSPA+ provides very high bit rate and QoS, you cannot compare the first UMTS release with the latest GSM (EDGE) release... it's simply wrong! I'm not actually comparing UMTS to EDGE. I am saying that EDGE performance is an existence proof that it would have been possible to build a system with comparable performance without nearly so much complexity. I still stand by that. This stuff is all horribly over-engineered. You cannot possibly say that UMTS or HSPA+ is an elegant design. Furthermore, the spec appears to be deliberately obfuscated and many of the widely accepted books on these systems differ from both the spec and from the behavior of real systems. But finally we got our OFDM, under the LTE label, and even in its earliest installations it outperformed the CDMA stuff, every day new stations pop up here in Germany. LTE fulfills what UMTS had promised! Is Open BTS capable to support 3G? What will be its cost benefits over existing system? Anyone have any thoughts on using the 900MHz unlicensed band for UMTS on a test basis or even as a small WISP operator? I haven't seen any suggestions on this online and with the abundance of quad-band UMTS handsets you could easily get a bunch of people on the network without needing new handsets.